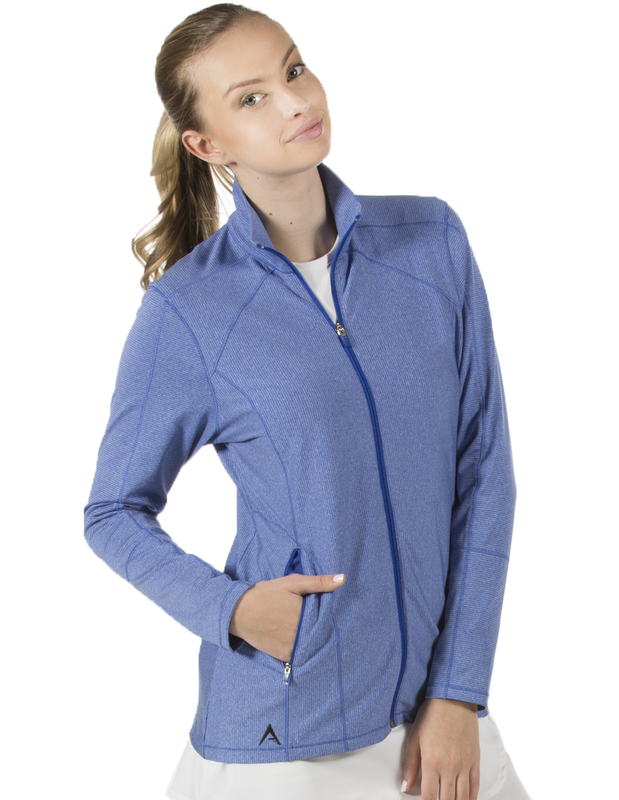 PEORIA, AZ – The Antigua Group, Inc. – one of the nation’s leading designers and marketers of lifestyle and golf apparel under the distinguished Antigua brand – announced its Spring 2016 Women’s Performance Collection outerwear. After two consecutive strong years for the Antigua Performance Collections, the Spring 2016 rendition will likely exceed sales forecasts — based on sales force reaction and hard sales data. The Spring 2016 Women’s Performance Collection outerwear is highlighted by fantastic fabrications that combine polyester and spandex, beautiful jewel tones, unique prints, and the continuation of successful silhouettes. 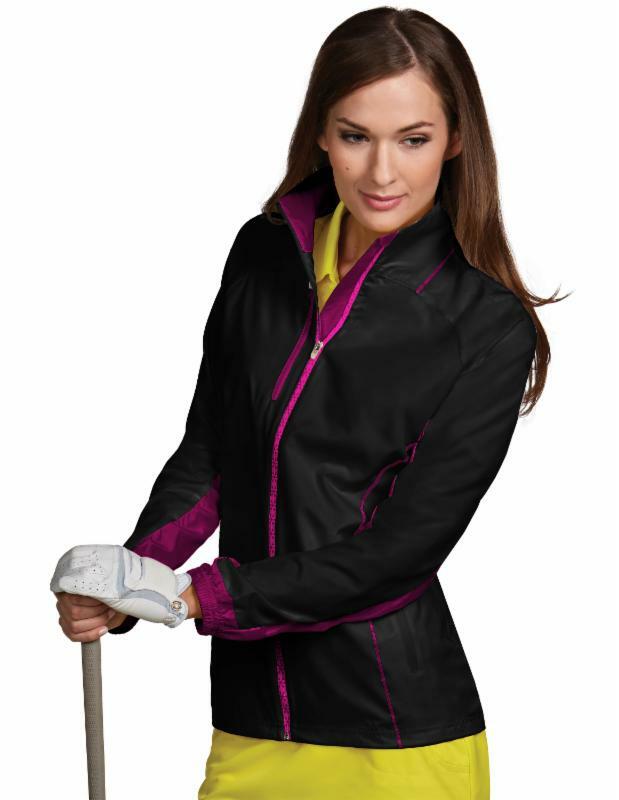 All fabrics and silhouettes have been LPGA Tour-tested. The color palette for Spring 2016 keys in on highly saturated jewel tones. “We felt the neon colors were slowly fading away and the more basic, primary colors were coming into play,” says Dellios. “Color direction in the sportswear market has been stagnant, so we took our cues from high fashion and made our our version of a primary palette. For the first time in years, we decided not to run pink, but instead picked a bright clean red called Fire.” Other colors include a true kelly green called Verdant, a vibrant royal blue named Hypnotic, a sunshine yellow aptly named Sunburst, and lastly a step away from the traditional purple with a more berry color called Mardi Gras. These primary jewel tones are paired with black and white throughout the collection. DESERT DRY™ is a moisture-wicking technology created exclusively for Antigua, to absorb and wick moisture quickly and evenly. The Desert Dry product family includes any garment using a fabric weight of 150 gsm or heavier. 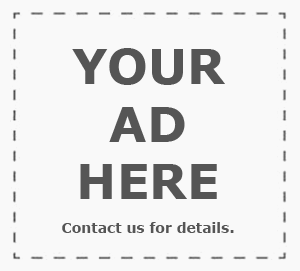 Typically fabrics over 150 gsm offer more body and improved drape for the customers who don’t like the ultra-lightweight “clingy” fabrics currently in the market. Examples of Desert Dry styles are Gypsy, Element, Jewel, Ascent, Stroke, Strive, Movement, Maverick, Equity and Pure. DESERT DRY™ XTRA-LITE (D2XL) combines Antigua’s exclusive DESERT DRY™ moisture-wicking feature with specially constructed ultra-light fabrics for maximum wicking performance and optimum comfort. The D2XL product family includes any garment using a fabric weight of 150 gsm or lighter. These fabrics have been specially engineered to be lightweight while not being overly sheer. This is possible through the use of ultra-fine yarns which gives a fabric more body while not dramatically increasing the weight. Examples of D2XL styles are Champ, Jubilee, Premium, Radical & Modern.